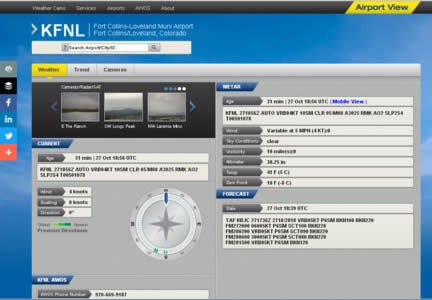 The Airport View weather camera system (AV Wx) delivers continuous weather images from your facility to the AirportView.net website. The site publishes your images, plus other airport weather data and airport information, to users worldwide. That visibility on Airport View increases awareness of your airport and can drive traffic to your own website. Each AV Wx system includes four high-resolution color digital cameras that watch the skies all day long. 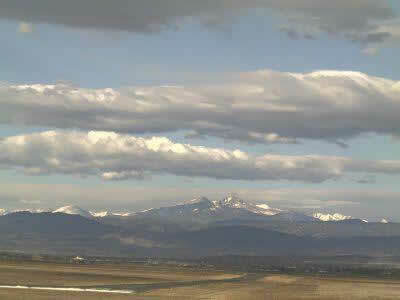 Our website, AirportView.net, displays current snapshot and time-lapse weather images along with AWOS, weather radar, and satellite weather information. The cameras take large high-quality images using a wide-angle lens that maximizes sky coverage with minimal distortion. The system has been professionally designed for installation and operation outdoors, where it can withstand the harshest weather conditions. When mounted in stable, secure locations, the images delivered are of far higher quality than the typical DOT traffic cam. We pre-configure the system to your network environment so that the components will operate as soon as they are installed, connected, and powered on. The cameras begin capturing images and sending them to our server immediately upon activation where they will be available to users worldwide. We can even make these same images available for use on your web site as well. Further details on this special feature available upon request. Existing radio towers or beacon towers are ideal mounting platforms. Cameras can also be mounted on masts attached firmly to existing structures such as hangars or other buildings. Building walls also make good mounts for these cameras. We have the expertise and experience to consult with you to determine suitable mounting locations. Experienced network equipment installers deliver the best results. Contact local installers for quotes. Reference "Table 2" below for site requirements. Camera mounting Accessible tower or building locations with appropriate views of the desired sky sectors. Internet Reliable, continuous internet connection with a minimum speed of 500 kbps. Network Connection to any node in your network with internet access. By default we use the 192.168.6.X subnet. If that subnet exists in your local network, contact us to arrange a different configuration for your camera system. Exterior network cabling Cat5e, exterior grade, shielded cable recommended for exterior use between all cameras and the interior equipment (POE network switch). Building-mounted cameras can use an interior grade network cable. Cable length Up to 300 feet for cables connecting each camera to the POE network switch. Cable routing Access to entire cable route from cameras to Edge Server network computer, and from Edge Server to local node with internet access. The price for a 4-camera system with all supporting hardware, fully pre-configured and ready for installation, is $2,995.00 plus shipping. This includes all the items listed in Table 1 above. Call today or use our online request form below.